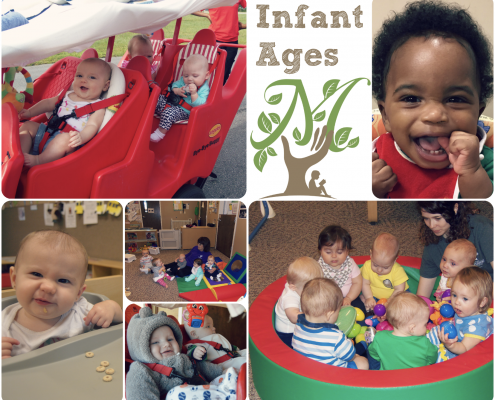 Our infant program serves children ages 6 weeks – 12 months. Some daycares lump all of their infants into one room, but RHM understands that children at this age develop at a fast pace! We have two separate infant rooms for our mobile and non-mobile children, ensuring that all of our children have a safe space to play and grow. Of course, while our babies play, they’re learning without even realizing it! We focus on several key components of brain and physical development to provide an enriching Infant experience following WINGS curriculum and GELDS. Understand through singing and finger play, stories, poems, songs and music. Learning through pictures, words, and beginning alphabet. Experiment with a variety of textures, surfaces, sights and smells to broaden senses. Encourage movements for healthy growth and development. Participate in a variety of indoor and outdoor activities to increase strength and endurance of our gross motors. Use hand-eye coordination to begin defining fine-motor tasks. Counting, through song and finger play. Express feelings through actions and language.